How long has the Boxee iPad app been in development? We're not sure, but it looked pretty solid when we shot this video at CES in January. The wait is over, however, and the app, which offers easy integration with a user's Boxee account and Boxee Box, is finally available for free download from the iTunes Store. To get the most out of Boxee for iPad, the first thing you need to do is download the new Boxee Media Manager program. It scans your Movies folder-or any other folders you select in the program's preferences-for compatible video files. 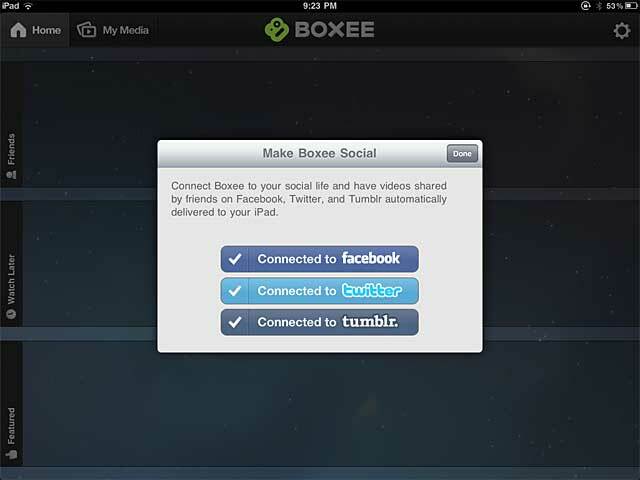 Once you've done that, installed the Boxee for iPad app, and linked the app to your Boxee account as well as your Facebook, Twitter, and Tumblr accounts, the app is ready to go. The home screen gives you three columns (in portrait mode) or rows (in landscape mode). 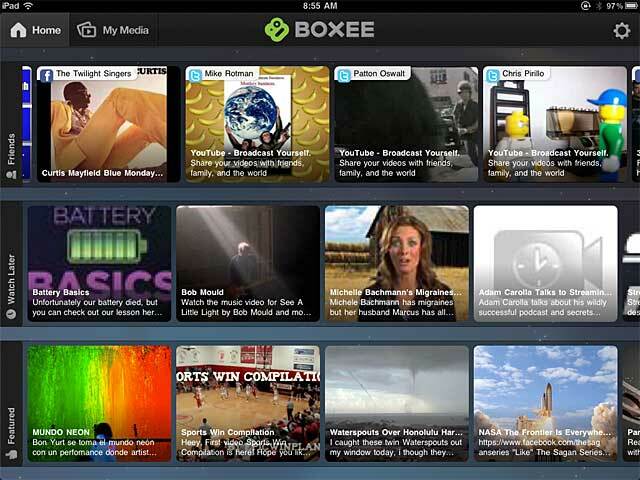 The top row is your Friends feed; the middle row is your Watch Later list; and the bottom is a list of featured videos suggested by Boxee. The Boxee for iPad home screen. From top to bottom, you see your social media feed, your watch later list, and suggested featured videos from Boxee. When your Facebook and Twitter contacts post videos, the videos automatically appear in the Friends feed. To use the Watch Later function, you need to install the Boxee Watch Later bookmarklet in your desktop browser. If you click on that bookmarklet while you're on a page with a video, that video will immediately show up in the iPad app's Watch Later feed. Note that it doesn't work with all online video, and while some fails are to be expected (i.e., you can't save a Hulu video to watch later), some were surprising-we couldn't save any videos from Beet.tv to our Watch Later feed, even though Beet.tv freely allows for sharing and embedding its content. 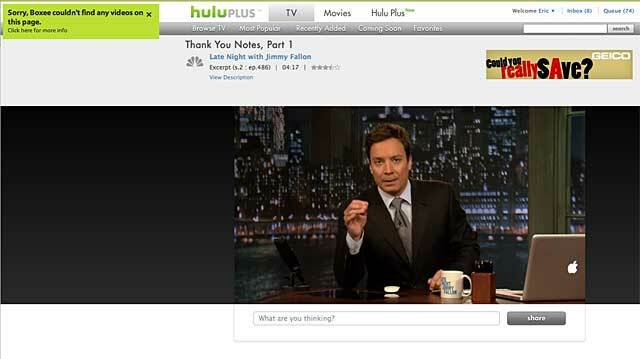 If you try to save a video from Hulu to your Watch Later list, you get a message that there are no videos on the page to save. Not entirely accurate, but it does the trick. Typically, you'll get a message like the one shown above from Hulu's page. We found, though, that we would sometimes get a success message, only to find that when we went to watch the clip in Boxee for iPad, it wouldn't play. That's likely not a failure of the app, though, but rather a broken link or some similar error from the source page. That makes sense, because the Boxee for iPad app doesn't play all Watch Later videos within the app itself. In the case of a Vevo video, for instance, the app sent us to the Vevo for iPad app to watch the clip; in the case of a Funny or Die clip, it displayed the entire source page within the Boxee app's frame. That's cool, because the app's frame displays four useful icons: a TV icon that lets you fling the video to your Boxee Box (which you can control with Boxee's iPhone Remote app), a minus sign icon that removes the video from your Watch Later list, an email icon, and a heart icon that allows you to share the video with your social networks. Click on the heart icon at the top of the app frame to share a video with your social networks. Then there's the My Media tab at the top of the app. Its functions will be redundant and therefore likely unnecessary to anyone who uses iTunes to watch their downloaded content (and of course, the Boxee for iPad app won't play back content purchased or rented from iTunes), but it nicely replicates AirPlay for those who don't use iTunes. Once you set up the Media Manager-which is a separate piece of software from the Boxee desktop app-and it scans the selected folders, all the compatible videos in those folders will appear in the My Media screen of the iPad app so long as your iPad is on the same Wi-Fi network as your PC. If you've got a mix of folders and files, you'll see both displayed on the My Media screen. The My Media screen displays both video files and folders from your PC right on your iPad. From there, click a file, and it displays almost instantly. Click play, and playback begins equally quickly. In fact, Boxee for iPad performed far better, speed-wise, than AirPlay typically does. Movies streamed from the PC to the iPad start playing back quickly and seamlessly. As mentioned above, Boxee for iPad won't play "official" iTunes content, even though it will show the file as being available in the My Media screen. This is one of those bugs that online video aficionados will find merely annoying, but the average consumer might find confounding. Boxee should add a pop-up that clearly says it cannot play back iTunes content; instead, it gave me a "connection error" message and no further explanation. When attempting to play an iTunes movie in the My Media screen, the only indication the app provides that it won't work is a "reconnecting" message, followed by a "connection error" note. 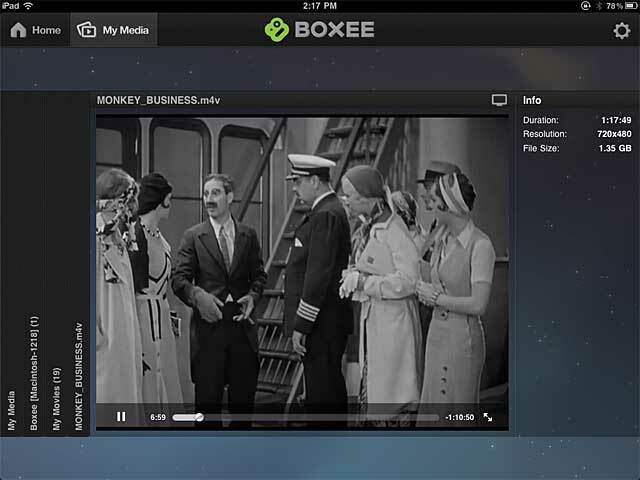 The only feature of Boxee for iPad that failed to impress us was the Featured videos section, which offered 14 clips seemingly designed to show off arty video (like a very cool "Nightsurf" clip) and the typical range of online video snacks-a TED talk, a few cool viral videos, and a collection of 250 movie scenes. We're assuming, though, that this was just a limitation of the pre-release beta, and hope that the final release will include at least some of the premium content that the Boxee desktop app offers, such as films from VUDU and shows from AOL HD and Revision 3. "Nightsurf," one of the arty videos offered in the Featured video section of the pre-release version of the Boxee for iPad app. Boxee Box owners can pre-order an adapter that brings live local TV channels into the interface. 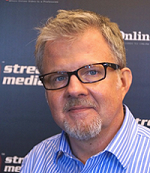 New funding will let the company create new features, refine the Boxee user experience, and gain partners. Owners can manually update their firmware to begin streaming Netflix videos immediately. 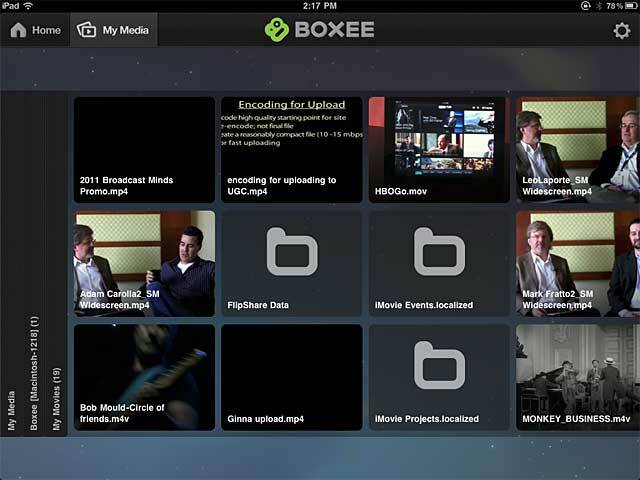 While the Boxee iPad app won't appear in the iTunes Store for several months, we got a sneak peek at CES. Get a feature tour in this video and see what you can expect.